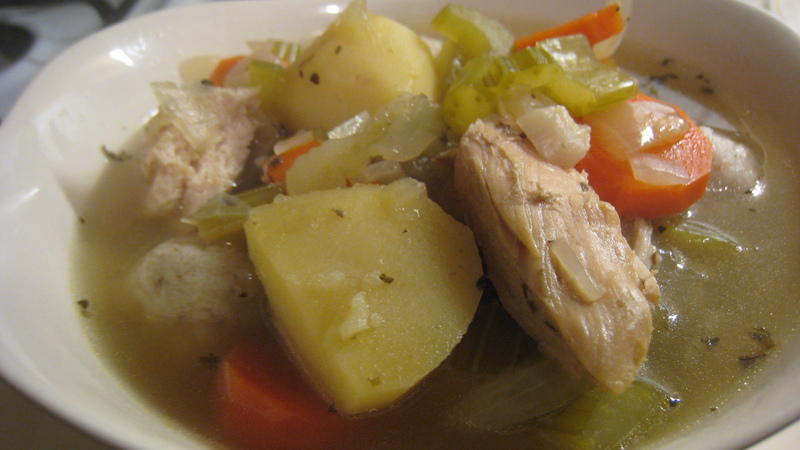 Chicken Matzo Ball Soup – PROPA!! Actually, I lied. This is the version of the soup I make when I’m a self-piteous ball of frowns. It’s a low-labor-intensity meal. Just throw a buncha stuff in a pot, cover with stock, and boil until it’s soup. A pile of Delicious. 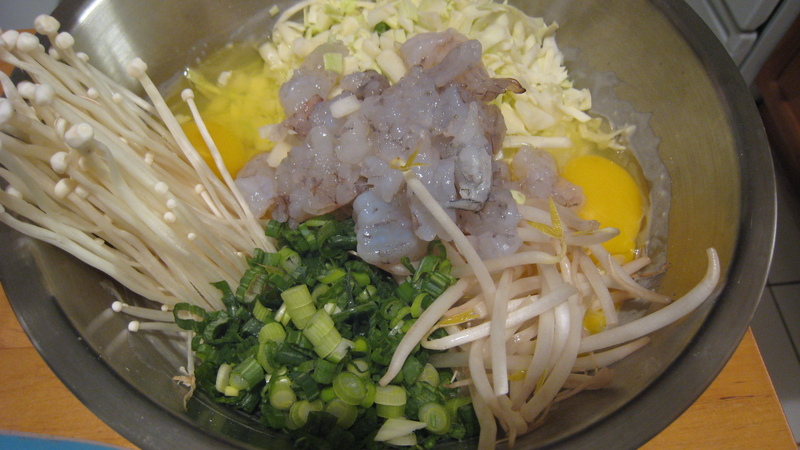 In Broth. 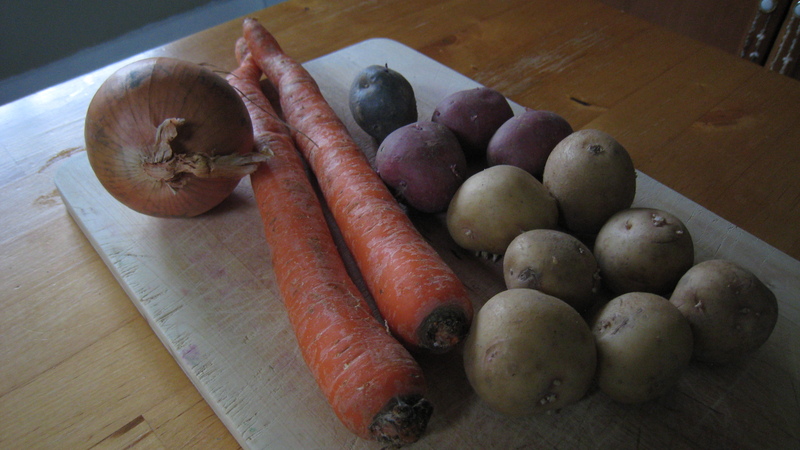 I started with my trusty Boston Organics veggies: carrots, a yellow onion, and some potatoes. Why is this picture so dark? Oh yes, it was because of my personal storm cloud. 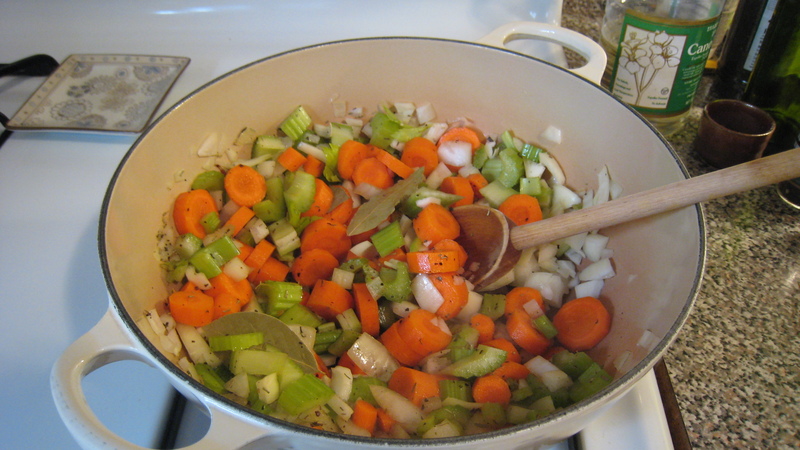 Regular soup base: carrots, an onion, celery, herbes de Provence, salt&pepper. Wooden spoon not added for flavor. 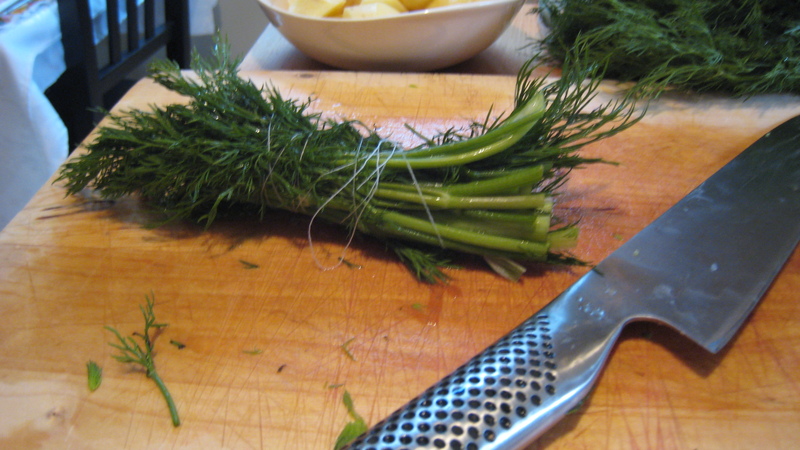 My mama always adds a LOT of dill. Then I just threw the rest of the ingredients into the pot, covered with stock, and simmered for 1.5 hours. You don’t have to cook it that long. It’s pretty much done after about 30 min. 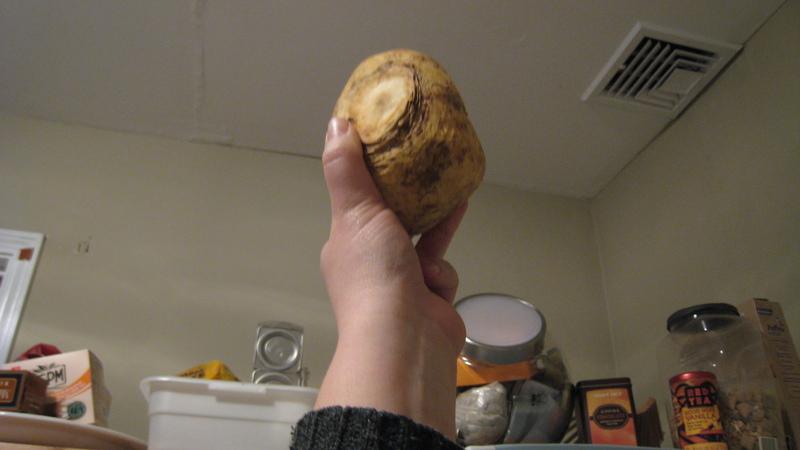 But I like for the meat to fall apart and for the potatoes to make it nice and starchy. Aaaaand meanwhile, in the other pot, I just made some matzo balls according to the recipe on the box. Nothing spesh. Did y'all notice I only own three pots? 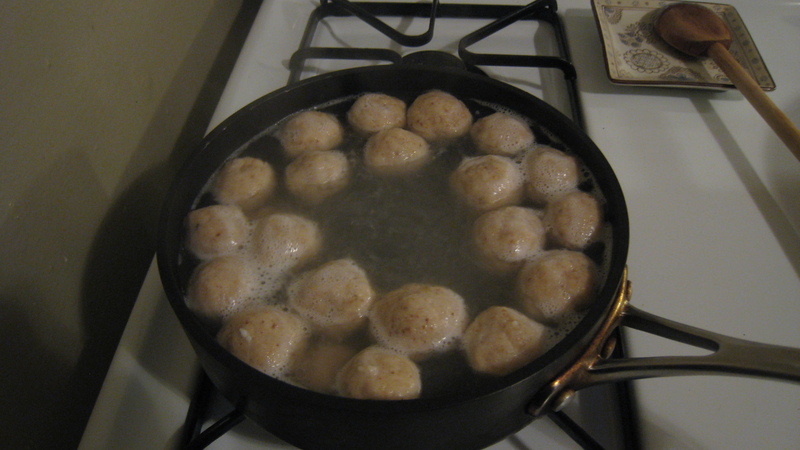 Bet you didn't know you can make matzo balls in a sautee pan! Thanks, Necessity! Chop all the veggies into bite-size chunks. Cook them down a bit in some olive oil with the herbs. 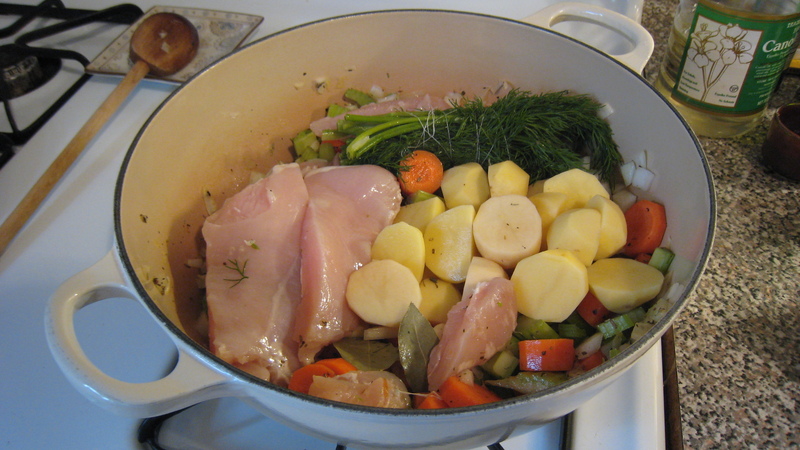 Add potatoes and chicken and dill. Cover with stock. Put the lid on and come back when it’s soup. 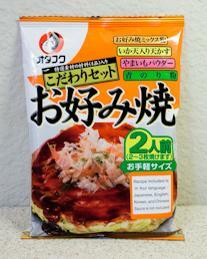 seasoning if your mazto ball mix doesn’t have it already. All I added was salt and pepper. My mama also adds chopped dill. It turns the matzo balls green. Tee-hee! That is not only true, but also rhythmically compelling. But I do win salad with salad. And thats not so bad. 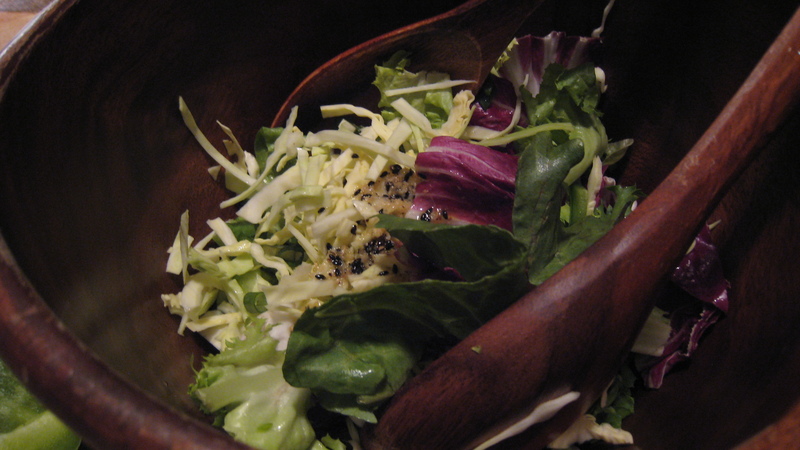 The only thing remarkable about this cabbage, lettuce, green onion is the dressing. And EGADS is it a spectacular dressing!! 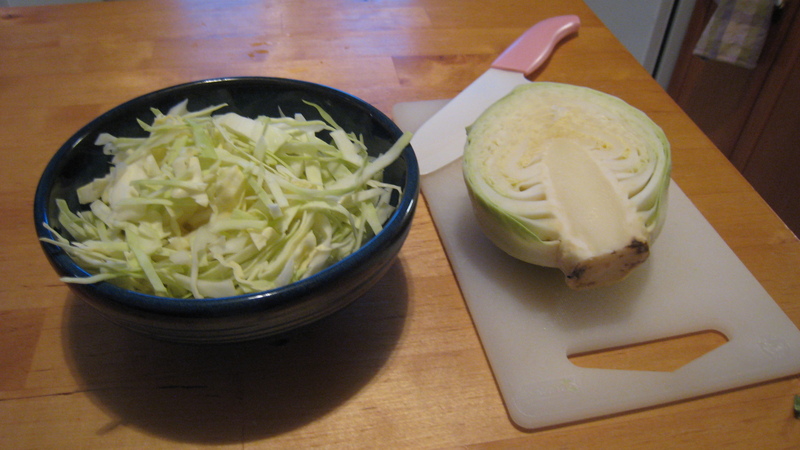 -1/2 inch of ginger, unpeeled and grated. Seriously, I’d drink the stuff. Yes, I know that title makes no sense. 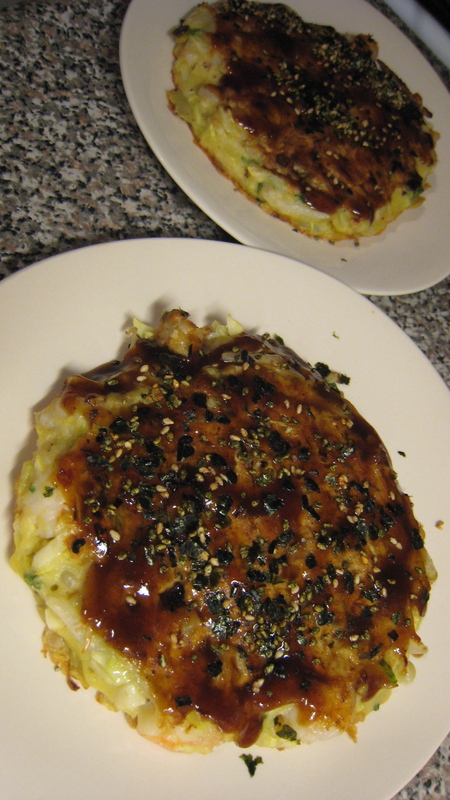 So remember when we made Okonomiyaki last week? Here are the pictures from that. 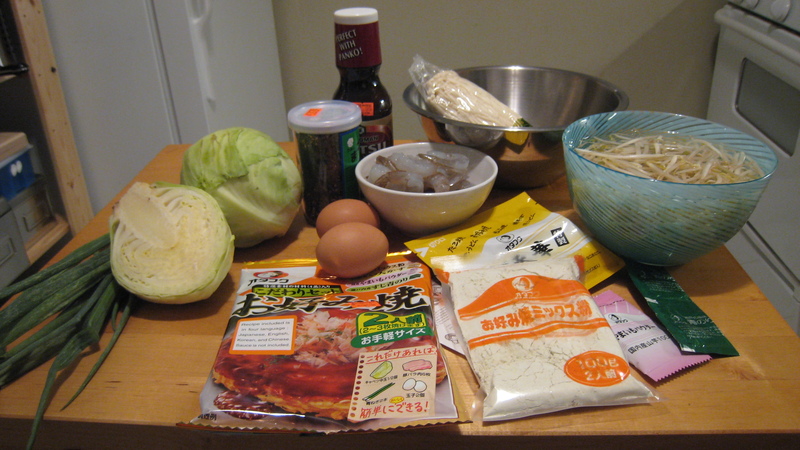 Okonomiyaki kit in all its splendor. Plus the extra ingredients not in the kit. 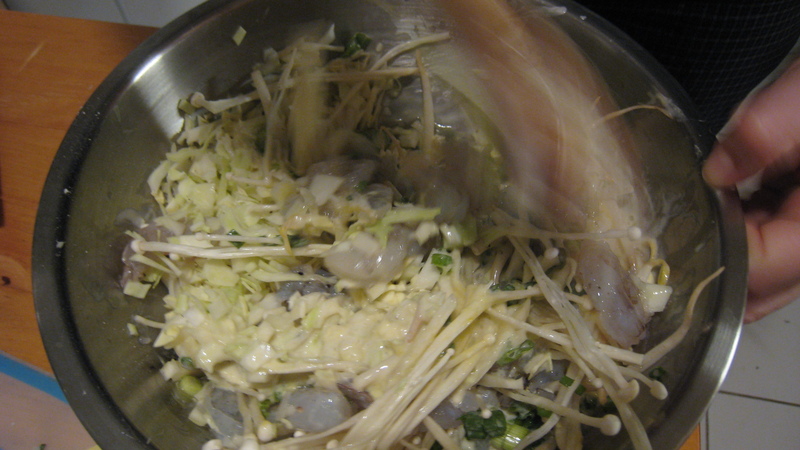 Dicing the shrimp. 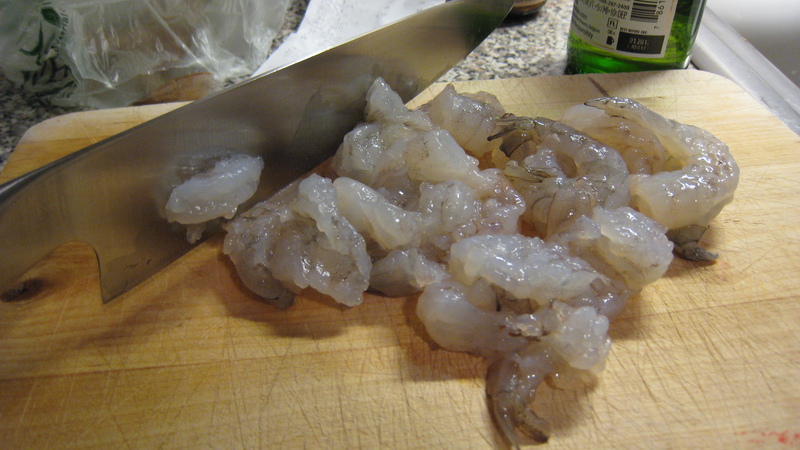 I didn't take pictures of cleaning the shrimp. You're welcome. Oppressing the masses...with a spatula. Egads, that is FREAKING DELICIOUS!! How many cabbages have I purchased in the last like 15 years? Maybe….2? So what do I do when I get two cabbages in my not-quite-CSA box? Panic. -Fish tacos with lots of shredded cabbage. After a friend mentioned the terms “fish tacos” in passing, I couldn’t think about anything else for like a week. So that was good. 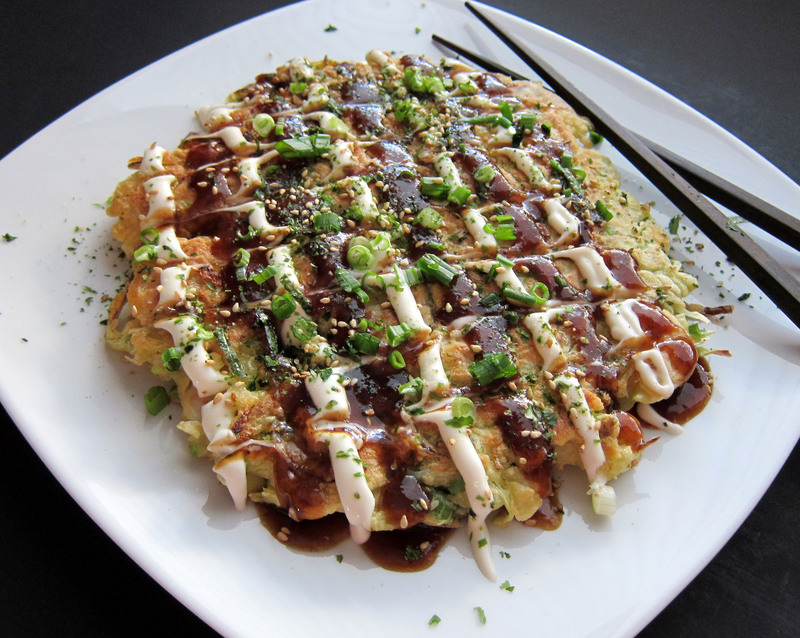 -Okonomiyaki….more on that in a future post. 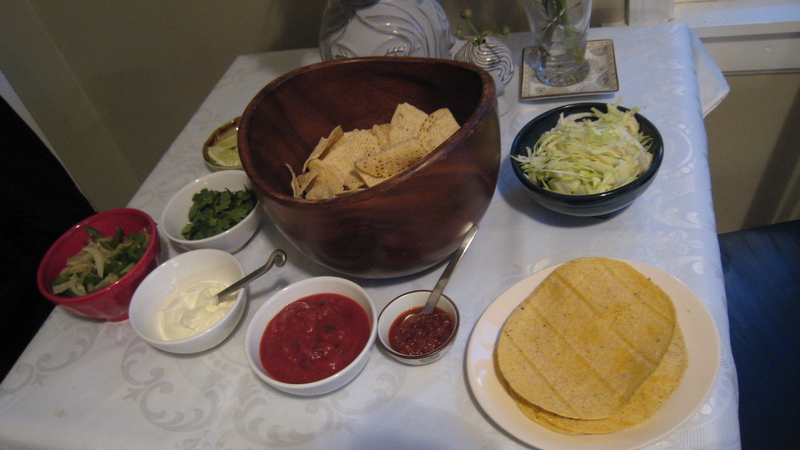 For fish tacos, I really wanted to emulate Wahoo’s Fish Tacos. I love these tacos in particular because of the piles of shredded cabbage. Never thought I would be that happy to see a bowl of shredded cabbage. Lemme tell you about that knife. It’s a Kyocera 5.5″ Ceramic Santoku. My friend gave it to me years ago, and it is still the sharpest thing in my kitchen. Fantastic device. Never needs sharpening, and great for small hands. This whole fish taco dinner thing was really easy. The only thing that required any kind of prep was the fish. We used tilapia. 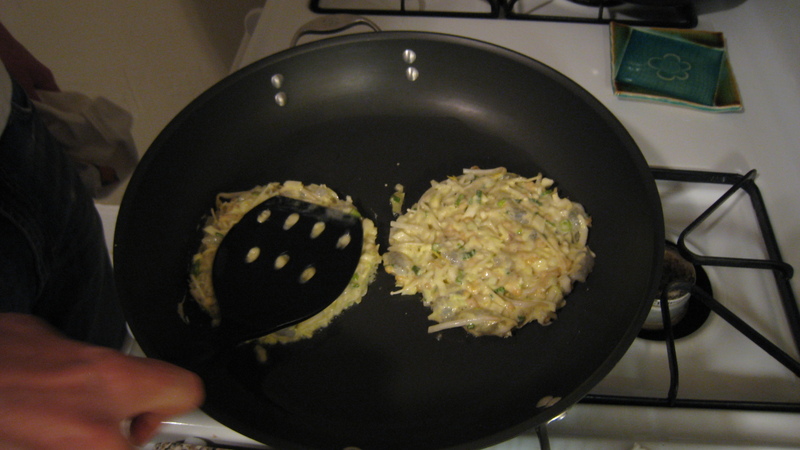 All we did was season it with a little salt, pepper, lime, and olive oil, then we sauteed it. -and a little bowl of garlic Rooster sauce, per Wahoo’s. …aaaaand the fish was in the sautee pan, out of frame. But it was there. I promise. Soooo….guess who forgot to take pictures of the finished product? Just imagine it looked like those Wahoo’s tacos above…. 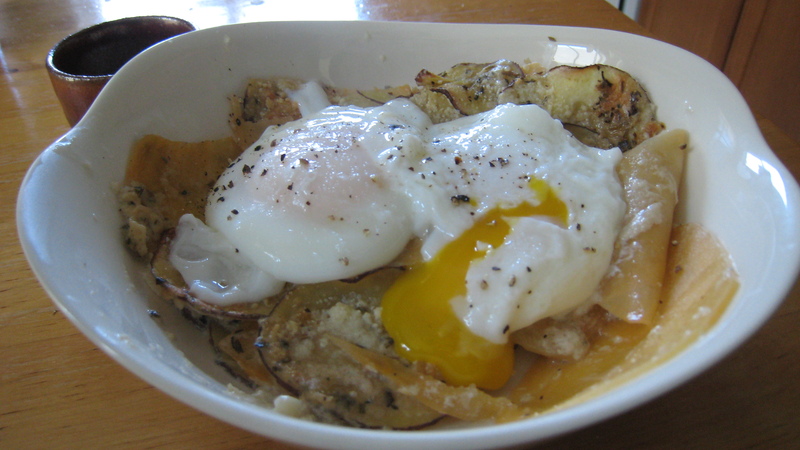 Gratin with poached eggs. There is nothing un-awesome about this breakfast. Purple and gold! An involuntary homage to the Lakers, I suppose. So I made this gratin. 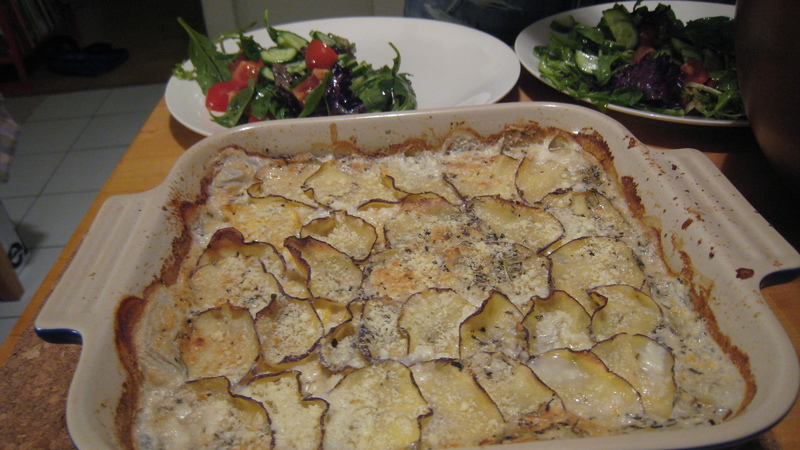 It has paper-thin slices of purple sun potatoes and gold turnips, some milk, some parmesan cheese, and loads of herbs de Provence. 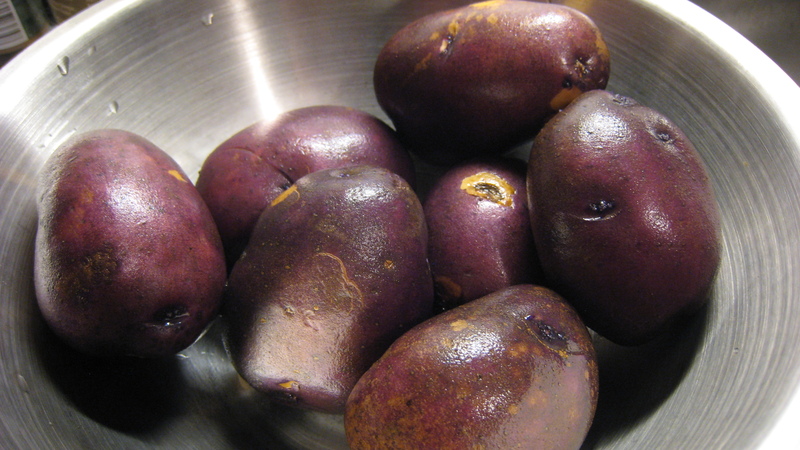 Purple Sun Potatoes, favorites of Louis XIV. Not really. 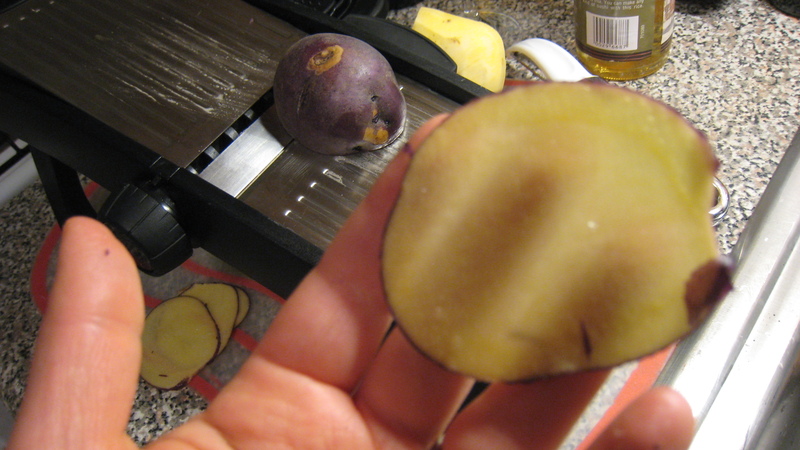 I got to slicing on my mandoline, which provided transparent slices of these burly roots. So thin you could use them on a slide projector. Not really. 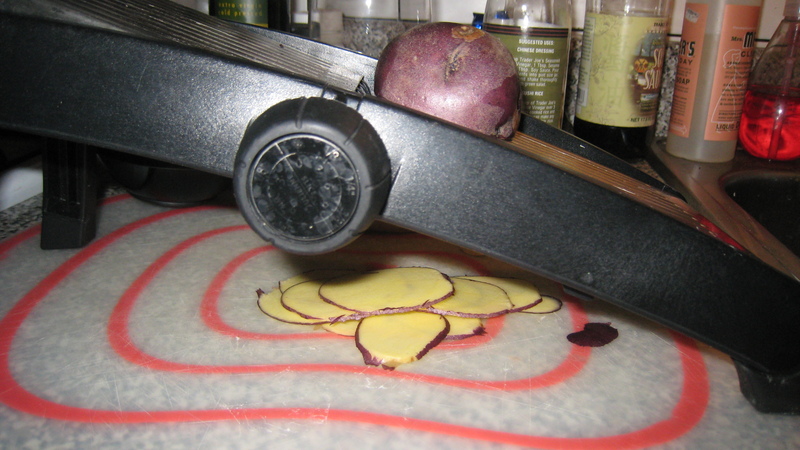 Next I buttered my Le Creuset baking dish and layered it with a maze of potato and trnip slices. 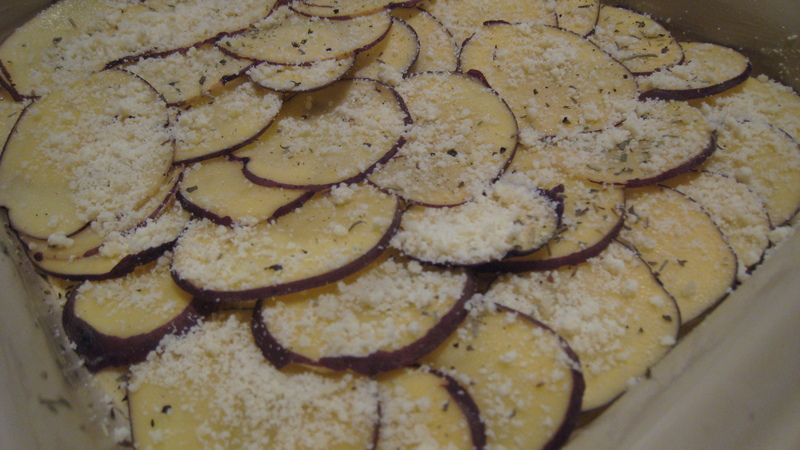 In between each layer, I put salt & pepper, herbs de Provence, and parmesan. Extra cheese on the top, and then added enough milk to just reach the top layer. And then baked it for about 50 minutes at 400 degrees F. And then it was dinner! 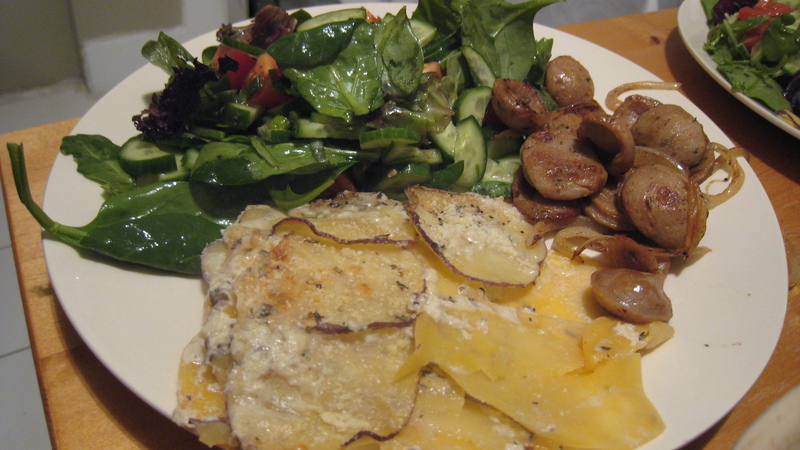 Gratin, chicken sausage sauteed with onions, and a salad. In my country, we call this "dinner".